A tropical theme is a great way to create a peaceful, relaxing atmosphere in your bedroom. 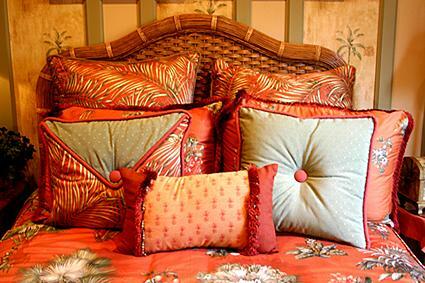 A well-chosen bedspread can provide the basic colors you need to build your own tropical color scheme. You can also choose a light background or dark background. Prices start at $199 for a twin and up to $929 for a king bedspread. With designer names such as Victor Mill and Hanalei Home, you know you are getting a high quality bedspread. You will see a couple of Hanalei Home prints at The Home Decorating Company, however to shop for their full line of tropical bedspreads, you must visit their online store. These luxurious bedspreads are made from 100% cotton bark cloth, a Hawaiian fabric that was popular in the 1930s and 1940s and is now commonly used in luxury homes and resorts. Another pristine feature is the hand guided quilting around the outlines of the leaves and flowers in the pattern, providing a rich, three-dimensional effect. These bedspreads also have an extra 18 inches of fabric at the top so you can easily cover pillows. You can request up to three different fabric swatches and have them shipped to you for free. Hanalei Home even offers a free matching service where you can send them a swatch of your decorating colors and they will send samples of fabrics that will match or coordinate with your existing furnishings. These elegant, designer bedspreads are quite pricey, starting at $599 for a twin and up to $799 for a king. Because Hanalei Home bedspreads are custom-made to order, you can request a specific size if the standard sizes don't meet your needs. One final shopping tip: When looking for tropical printed bedspreads, many designers use alternative names for specific designs. Bedspreads may be named after tropical areas, such as Hawaii, Kauai, Kokomo, the Bahamas or Sanibel Islands (Hanalei is a town on the island of Kauai in the Hawaiian islands). Names may also include capes, oceans, beaches, or islands. A well-designed tropical bedroom should make you feel like you're on vacation. When you step into the room, you should feel like you've just arrived at some luxurious tropical resort, a place where you can relax and leave the stress of the outside world behind. Creating a resort-like atmosphere in your bedroom is an investment in your peace of mind and well-being. Choose wall colors that will further enhance a tranquil, relaxing atmosphere in soft shades of blue, aqua, sea green, turquoise or mint green. Add a lot of rich texture with tropical wood such as rattan, wicker and bamboo. You can find area rugs, textured wallpaper and mats that are made from tropical grasses such as abaca and jute that can add primitive, natural textures to the room. Warm up the space with tropical foliage. Popular indoor tropical plants include rubber plants, palms, Boston ferns, umbrella plants and banana trees. If your bedroom lacks sufficient natural light for these plants, install some grow lights. A ceiling fan with tropical, paddle style wicker blades makes a lovely lighting accessory. You can also find tropical table lamps made from driftwood, natural palm and rattan. Add the finishing touches with natural embellishments such as seashells, coconut shells and raffia. Scented candles and scented oil diffusers can help you add a tropical fragrance to the air. A luxurious tropical bedspread can help you give your bedroom a resort look and feel. The next time you need to escape to a private tropical retreat, all you have to do is open your bedroom door.